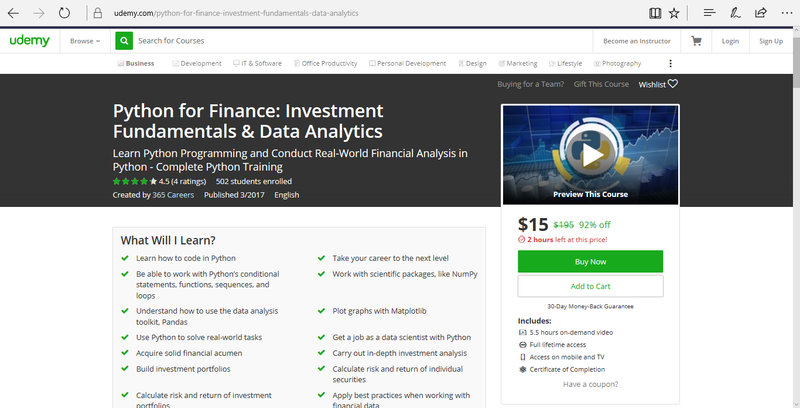 It would be helping me learn how to apply Python to Financial and Investment analysis. Below is a copy paste of a part of the course description and content. If you are a complete beginner and you know nothing about coding, don’t worry! We will start from the very basics. The first part of the course is ideal for beginners and people who want to brush up their Python skills. And then, once we have covered the basics, we will be ready to tackle financial calculations and portfolio optimization tasks. Everything is included! All these topics are first explained in theory and then applied in practice using Python. Is there a better way to reinforce what you have learned in the first part of the course? This course is great, even if you are an experienced programmer, as we will teach you a great deal about the finance theory and mechanics you would need if you start working in a finance context. What makes this course different from the rest of the Programming and Finance courses out there? 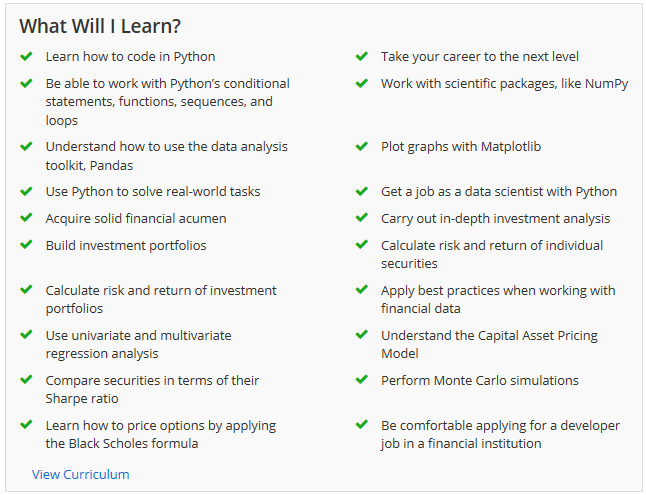 This course will teach you how to code in Python and how to apply these skills in the world of Finance. It is both a Programming and a Finance course. Knowledgeable instructors. Martin is a quant geek fascinated by the world of Data Science, and Ned is a finance practitioner with several years of experience who loves explaining Finance topics, here on Udemy. Extensive Case Studies that will help you reinforce everything you’ve learned. Course Challenge: Solve our exercises and make this course an interactive experience. Excellent support: If you don’t understand a concept or you simply want to drop us a line, you’ll receive an answer within 1 business day. Dynamic: We don’t want to waste your time! The instructors keep up a very good pace throughout the whole course. I have already begun taking the course. When It's Too Good To Be Good.